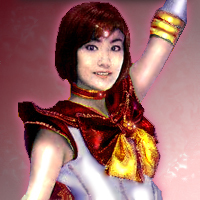 Sailor Astarte only appears in the Sailor Moon Musicals known as Sera Myu. She was apart of the third stage cast and was played by Asaya "Aya" Hosoda. She also may go by the name of New Moon Astralte, Shiba New Moon Astarte, Shiba Shingetsu Asutarute. The term 'shiba' means firewood and 'shingetsu' means new moon. Sailor Astarte's attacks are "Solomon Jihad" and "Solomon Birth". The Solomon Jihad attack is a powerful blast of energy that is capable of destroying the evil Sammeal sword in the musical. The Solomon Birth attack revives the fallen senshi when they got attacked. But it kind of looks like that she reverses time with Solomon Birth. When I watched this part several times it looks as though the other senshi who are laying on the ground seem to reverse the actions, like time is going backwards. Astarte's real name is Shiba Shingetsu Astarte. She is a transfer student from Europe. Her mother is part Phoenician, and used to live somewhere in the Meditarraen sea. Astarte as "Shiba" seems to be extremely introverted, meaning she's independent, quiet, calm, and level headed. Astarte has 4 different personalities, so I guess you could say she's bipolar, or if you prefer has a Multiple personality disorder. Her first personality is Shiba Shingetsu, the quiet nervous girl who recently just moved to Japan. Shiba is approachable and is not outspoken. Her evil personality is Dark Cain Sama, an evil entity who dosn't come out often, he's worshiped by the evil vampires in the Transylvania no mori musical. Her third personality is Death Vulcan Shiba, whom most people just call "Astarte". Astarte is an evil goddess like diety, who rules over the vampires, including Lillith (the evil vampire leader), Death Vulcan has control over the body of Shiba most of the time probably because she is the strongest. Her last personality is Sailor Astarte, the tenth Sailor soldier, from the other side of the sun. She comes to help the Sailor Soldiers very briefly. She seems like a determined strong character in this form, not scared at all, very bold. Sailor Astarte has red eyes (According to the Model kit) and has short brown hair in a bob style hair do. We already have a Sailor Senshi in red, Sailor Mars. These two senshi probably have a lot in common! Her costume also has common elements of other senshi, the similiar style boots, and the common red jeweled tiara. Also, the only other senshi to have red eyes is Sailor Chibi Moon and Princess Kakyuu. I recently found out that there is an asteriod called "672 Astarte", it is also refered to as a "minor planet" or a "planetoid". Its also is in our own solar system, and orbits the sun. From my notes, this minor planet is between Mars and Jupiter in the Asteriod belt. So I wonder if this is where the idea of Sailor Astarte came from. I'lll do more research on this one. All this information is from the musical, it's what happaned, so don't blame me if she sounds weird.